Morocco, Boujaad العيد الكبير , - where is Bob? Well, while i was studying in Morocco, i got assigned a 20 to 40 page paper on any topic. I thought a lot about it and I ended up wanting re-enact the celebration of Aid al Kbeer in two different parts of Morocco: in a village and in a city. Mohamed's house, and that is him walking on the right. The second time I came back to the village that tree to the right was full, and they use its leaves for tea and other remedies. Eid al Kbeer is an Islamic festivity, and it is the commemoration of the near sacrifice of Ibrahim's son to Allah: Ishmael. Once, Ibrahim proved to be obedient to Allah, his son's place was replaced by a sheep. For this reason, Muslims around the world gather around with their relatives and each family ( if it is economically possible... ) slaughters a sheep. 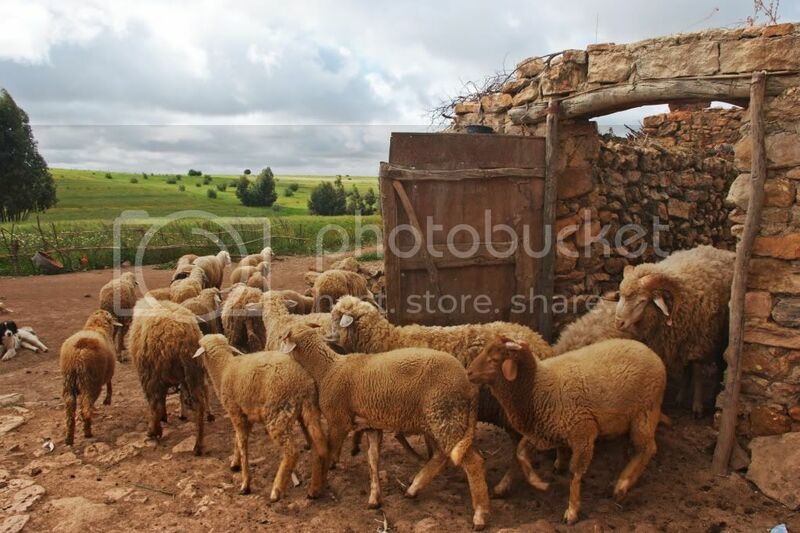 So I decided to reproduce the Eid by buying a sheep for each family I was going to be photographing. 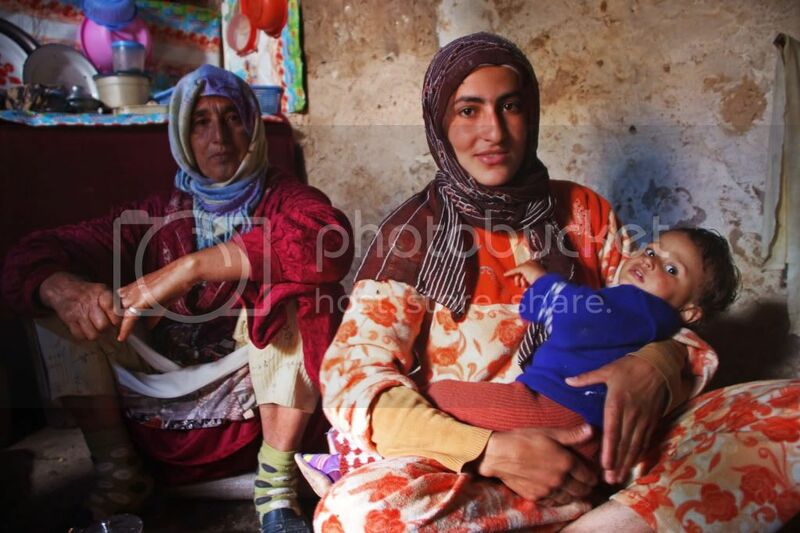 I also wanted to see how much does a family's economic level affects them when it comes to this religious celebration. do the dishes and ingredients change? how many people are involved? how to choose a proper sheep? etc.. The village family in their kitchen. The results were very surprising, because they were very similar in some aspects but they were extremely different in others. For example, preparation wise, in the city everything was a feast. 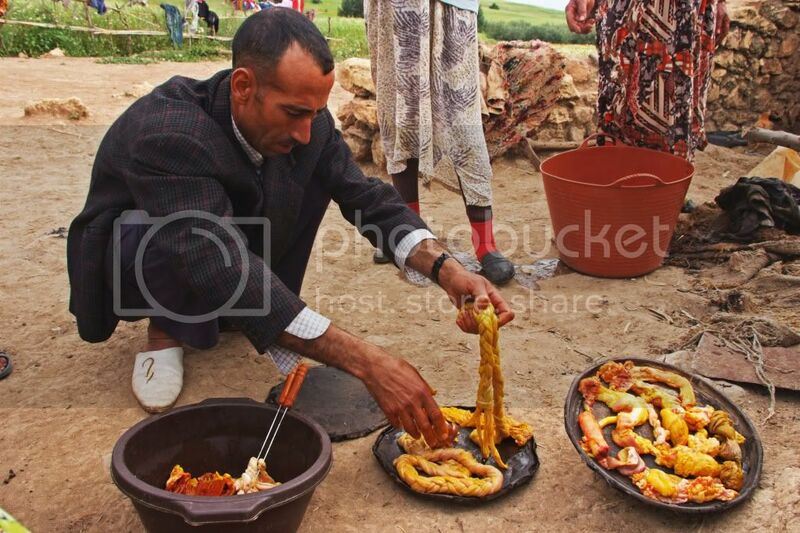 So many spices, and vegetables and many different flavors as well; On the other hand, the village was rougher. Personally I had a hard time eating the food there. All the organs were cooked for only 15 minutes and later served only by adding salt and turmeric! 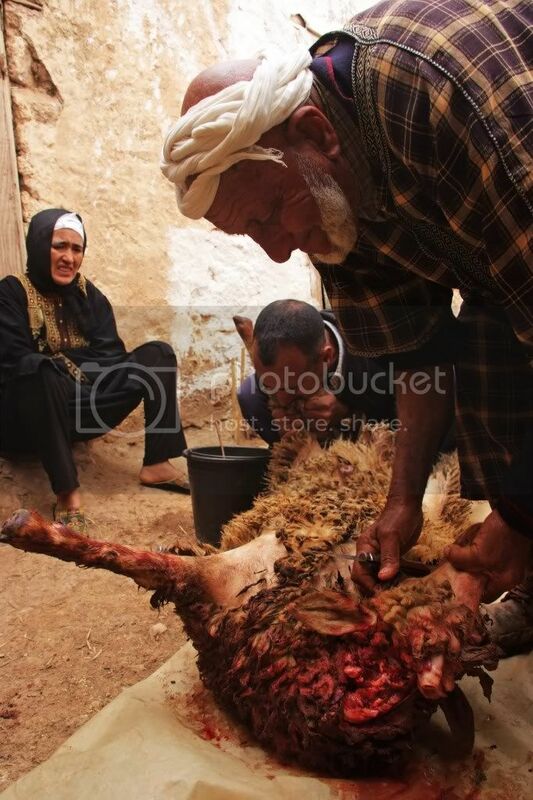 Mohamed removing the lamb's head while his son alo Mohamed is blowing through a hole he pierced in the lamb's leg. This is why the sheep look stuffed. This practice ceased to exist in most cities because it is said that if the person blowing is sick, the sickness can transfer to the meat and organs. 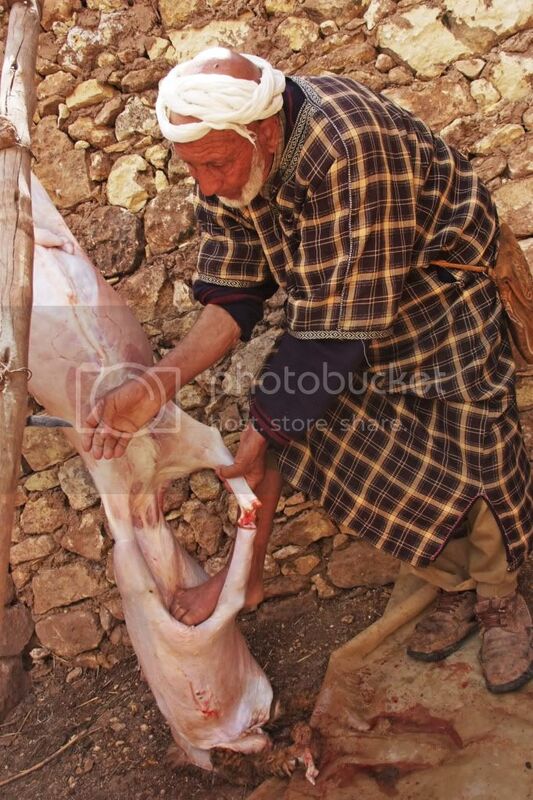 Here Mohamed helping himself with his foot to pull down the skin of the lamb that will later be turned into a carpet. 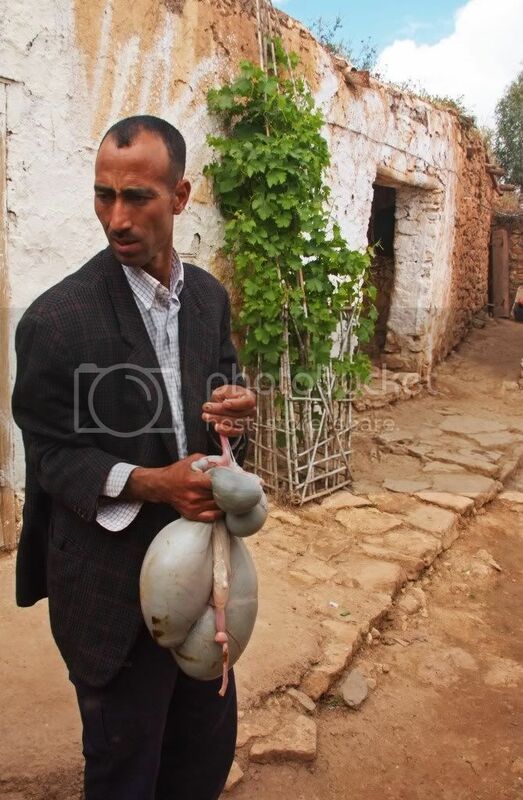 Mohamed son with the lamb's stomach in his hands. It had just been taken out by his father, and he is going to clean it although there is a lack of running water. In the city, sinks made life easier to clean a stomach since it is very hard because of all the texture and folds the walls have. Here, they just used water from the well and to be honest i think this is what gave me an infection later that trip. It was poorly cleaned, cooked and seasoned... it tasted like digested weeds and poop. In the village, it was such a traditional setting. It felt like I was back in time where there were no stoves and no running water. Because these people really did not have any of those. The Aid of the village consisted of 18 members at its highest point, but in the city it only reached 6 people. Little Osama looking at me, and I love the back if you can enlarge it, Fatima Zahra is in the back of her mom crying while looking at him and he is looking at me. 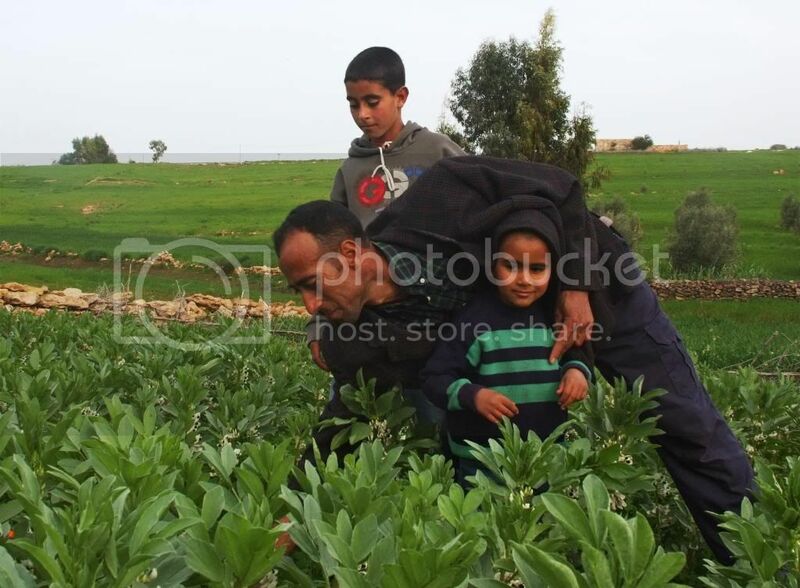 Mohamed and two of his sons: Rasheed (in the back) and Osama underneath his coat. It is a nice metaphor of life. 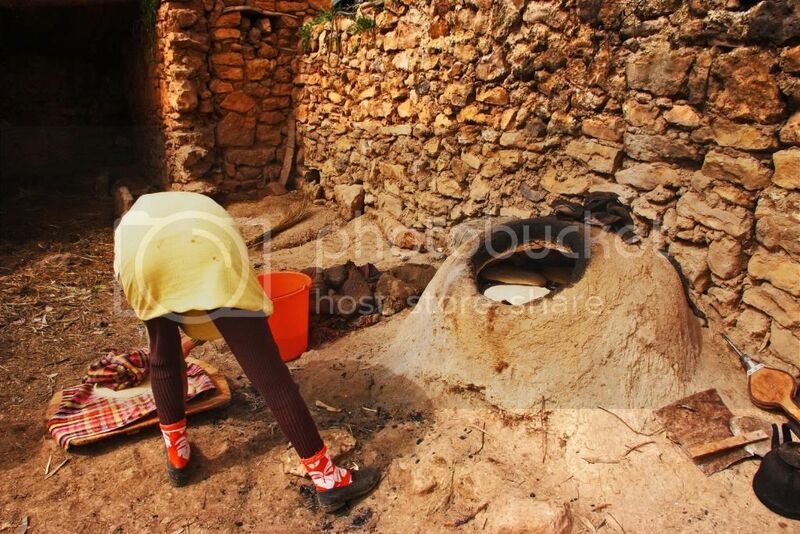 Hada, Mohamed's wife leaning down to get the dough she is about to put into that hand-made oven to her write. I like it because it looks like a pair of legs without a body. One of my favorite pictures of the project. 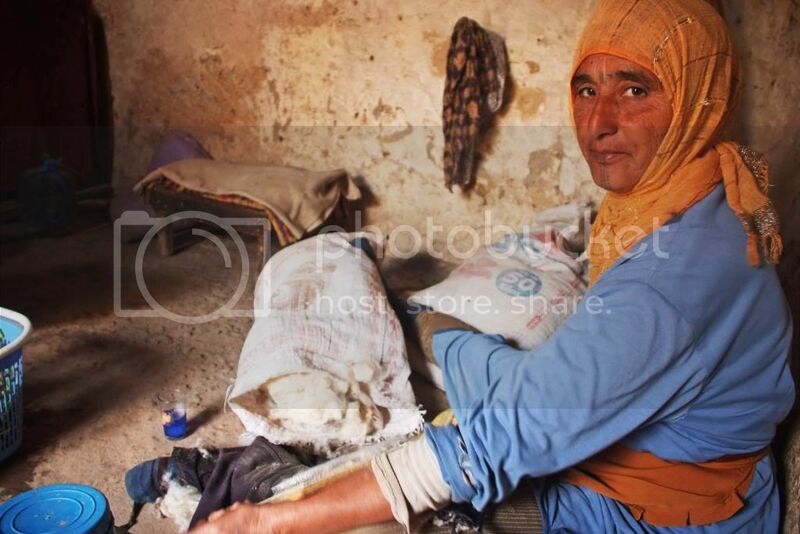 If zoom is available, use it to notice the Berber tattoos she wears on her chin and forehead. How she is in the process of weaving a new blanket. Also, the colors of her clothes and it was getting dark, I think it is beautiful. 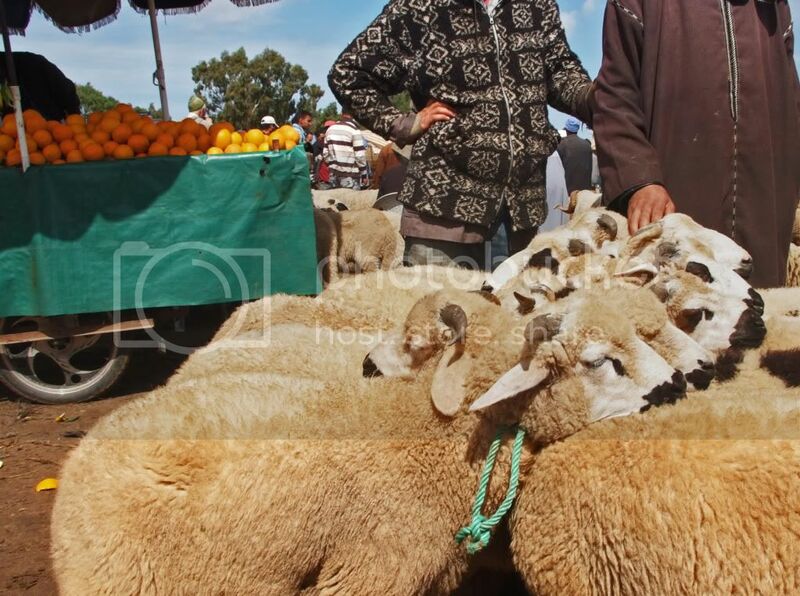 In the city, we had to go to the cattle souqs of Rabat and its neighbor city Sale. 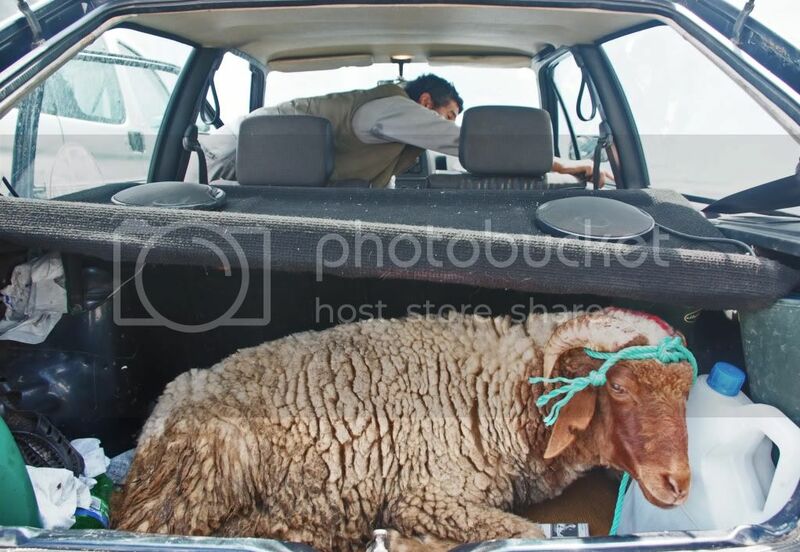 I took a veterinarian with us, so he could make sure we were not getting a sheep sick or a low quality one. 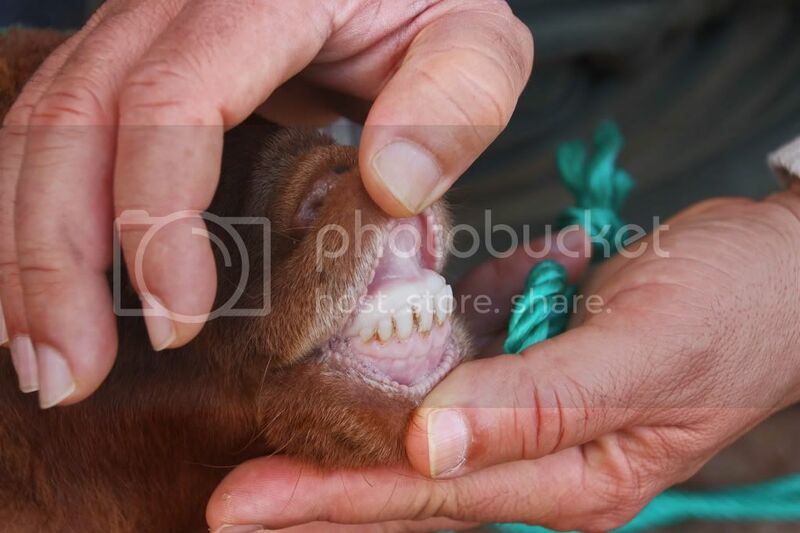 We checked everything: the teeth,the eyes, you have to make sure they are not exorbitant or inflamed. The poop, or traces of it, can't be loose because that shows gastric problems. We checked how bony the animal was by feeling it through the wool as well. We thought we had check everything in the animal, and bought it. We later discovered it had an old wound that had already scarred at the back of one of his legs. We were only able to tell when the animal was skinless. In the village i bought the sheep from The grandfather of the family I was living with. I payed same price, and as prices go and logic: everything is cheaper outside of the cities. 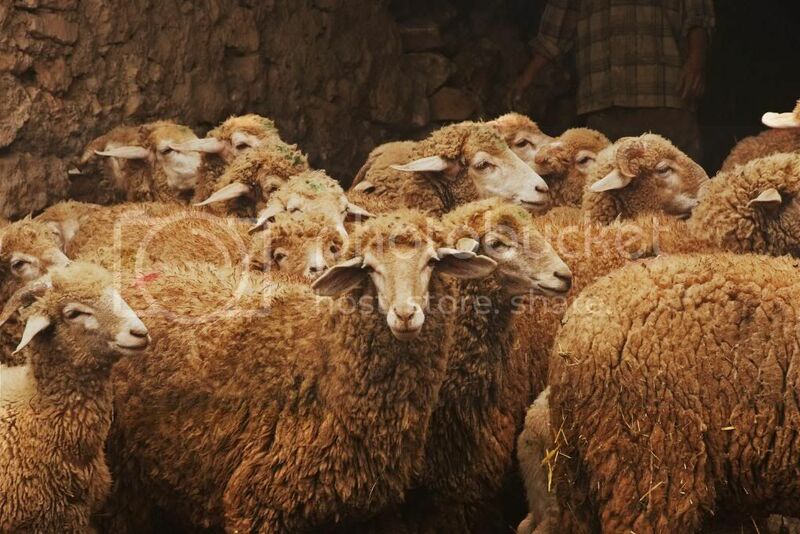 The sheep waiting for Abdelrahim (front) to get going.